Each year in May, the Town Mayor is elected by a vote at the Annual Meeting of the Town Council. Councillor Galan Moss was elected as Mayor for the 2018/19 civic year. 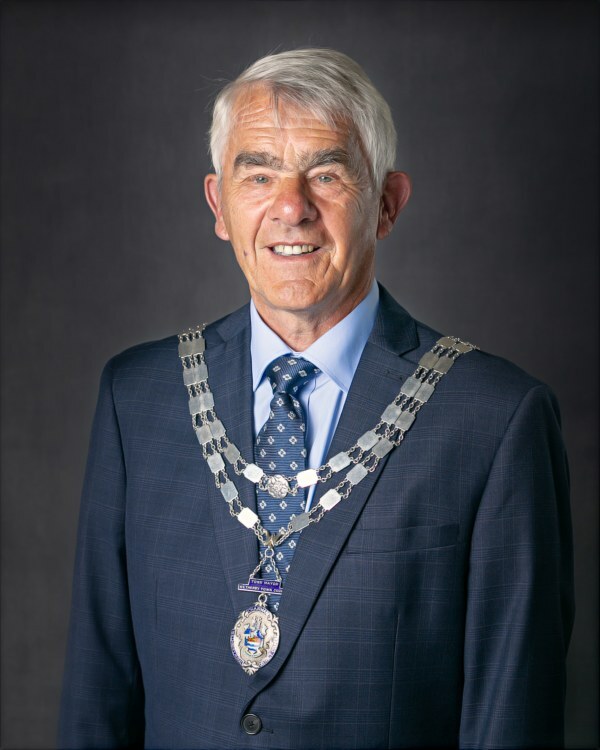 Councillor Neil O'Byrne is the current Deputy Mayor. A list of former Mayors can be viewed here. Date, time and expected duration of your function. Whether you require the Mayor to perform a specific function (e.g. starting a race, cutting a ribbon etc). Background information if you require the Mayor to give a speech. Each month the Mayor submits an article for inclusion in the Wetherby News. What a busy but enjoyable and exciting month Sandra and I have had. It all started with an invitation from the Mayor of Harrogate to Harrogate Borough Council’s Civic Service at Ripon Cathedral. We met friends old and new and enjoyed the art exhibition which was mounted in the Cathedral. Our next engagement was at the Wetherby Young Offenders Institute to present 10 of the boys with their Bronze Duke of Edinburgh Awards after they completed an expedition. This is a landmark for the Institute as it was the first time the expedition was fully completed within its grounds. The boys had prepared a special presentation showing all the activities they took part in and the skills they demonstrated to qualify for the award. We also toured the establishment and saw numerous classrooms where the boys are trained in building; joinery; catering and horticulture to name but some of the courses. What can I say about Wetherby Open Day which took place on 13 October? Where does one start? Sandra and I began our day with the official opening of all three refurbished playgrounds at Scaur Bank, Nidd Approach and Mason Field. We were pleased that the playgrounds were already in use for a little while before the official opening. We heard many compliments; one which stayed with me was from a young mother that it makes her life a lot easier because her children are now keen to get out and about. There were 10 venues to visit where a Wetherby Passport could be stamped. We collected all stamps and thoroughly enjoyed the entertainment in the Horsefair Centre. I must congratulate the team from Welcome to Wetherby, all the exhibitors in Town Hall, and all the volunteers at the various venues who made the day such a success. On that same evening we attended the 85th Annual Dinner of Soroptimist International of Harrogate and District. Soroptimist International is a worldwide volunteer service for women who work for peace, and particularly to improve the lives of women and girls in local communities and throughout the world. The entertainment was provided by the Wetherby U3A Ukulele Group which we thoroughly enjoyed. Sunday 14th October proved to be just as busy and interesting as the previous day. In the morning, Sandra and I attended Wetherby Festival Harvest Service at St. James’ Church. The congregation donated produce to be shared between St. George’s Crypt; Wetherby Foodbank; All Hallows’ Community Café and Caring for Life. The Wetherby Combined Schools Choir sang beautifully. I presented the prize to the winner of the Wetherby Festival Scarecrow competition; congratulations to Wetherby Micro Brewery which won first prize and to Appleton’s Butchers which came second. The following day, Monday, we attended the Community Harvest Festival at Wetherby St. James’ Church. The service was very relaxed and jolly with singing and dancing. I would to thank everybody involved in making this a wonderful month. Remember, these events don’t just happen; they involve a lot of hard work by volunteers. I kept up my intention to praise good work by speaking to the boys at the YOI after the presentation and congratulating them on their achievement.